OVER 20,000 TROX PRODUCTS IN STOCK. Airfoil’s vision is to redefine the service levels for the Australian air diffusion industry in 2017. We want our customers to have access to our products as soon as possible after ordering, therefore, we keep 80,000 of Airfoil’s standard products in stock at all times. We’ve now added 20,000 standard products from the TROX range. This enables us to slash lead times, secure delivery schedules and give customers peace of mind when ordering from all of our standard product range. When Airfoil took over the primary distributorship of TROX products in May 2016, the lead time for any TROX standard product was 12 weeks, sometimes longer. Airfoil prides itself on living up to our motto “Making it happen sooner” and as a market leader, we look for ways to make our customers life easier and more productive. It just made sense that Airfoil should stock standard TROX products for our customers. Now we can immediately deliver the standard products from our specially build storage facility in our Sydney Factory Complex. So now the lead time on TROX standard products is slashed to 5 to 7 days. No more waiting, no more worrying about shipments. Just order and they will arrive on time. 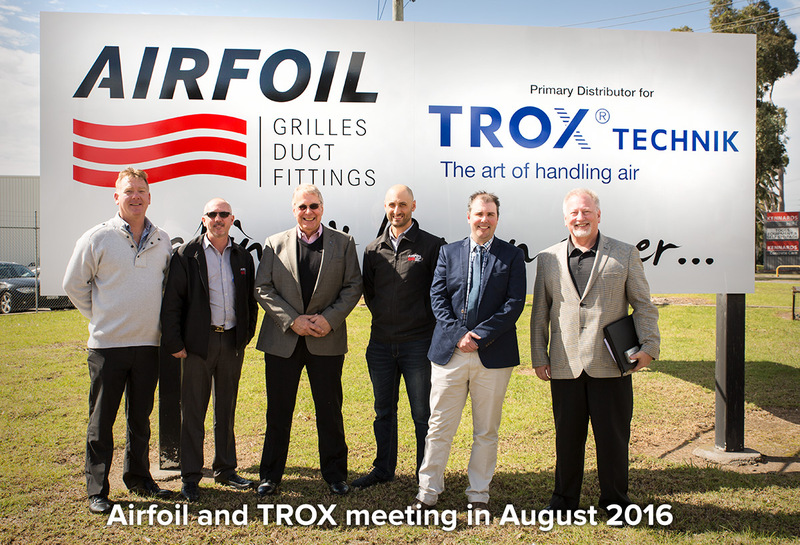 Airfoil’s Managing Director, Adam Carney met with TROX CEO, Chairman and President of TROX Asia and Pacific Operations (APO) Pieter Jooste at the Airfoil factory complex in Sydney to discuss the strategy and partnership in August 2016. We are the only manufacturer and distributor in the sector to have Quality Assured Systems. This provides us with the framework to deliver the best service in the industry. Any mistakes are logged and corrected. An internal audit is performed monthly and an official audit by SAI Global every six months. You can have confidence that we are continually improving our processes to provide you with better service. In 2016 Airfoil Manufacturing celebrates its 40th year of business as Australia’s leading manufacturer of air diffusion products. 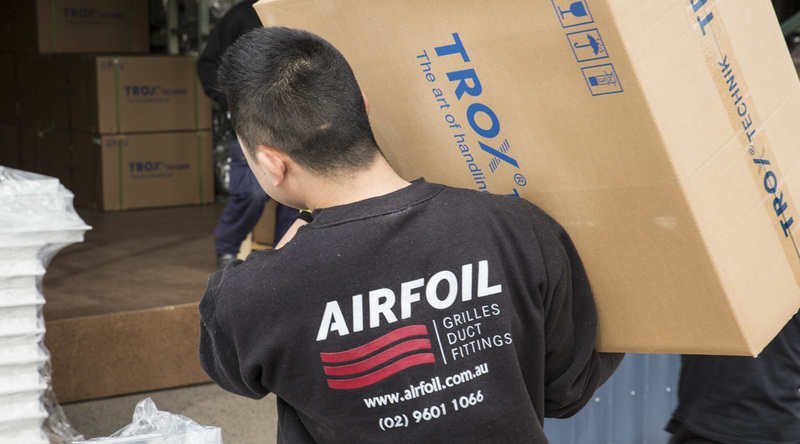 With the TROX product range, Airfoil has the widest range of air diffusion products available under one roof in Australia. We have supported this expansion in products with investment in people with the right knowledge to assist you. 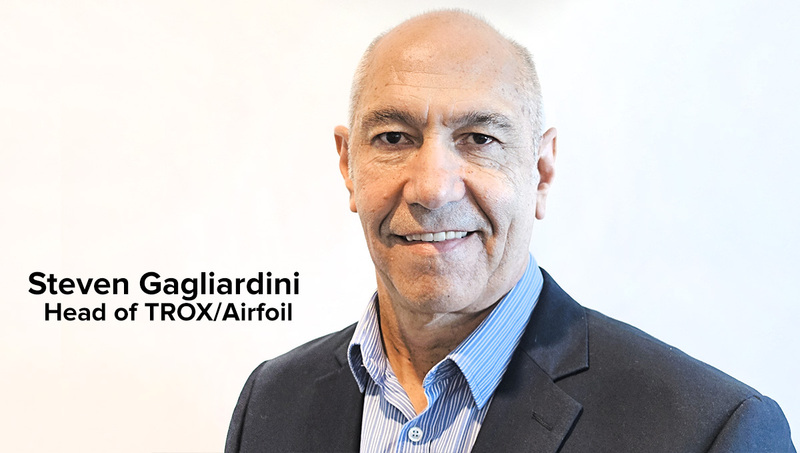 Steven Gagliardini joins us as Victorian General Manager and Head of TROX/Airfoil. He leads the newly formed branch in Dingley Village Melbourne servicing the whole of Victoria. In his recent six-year term with TROX Australia as Technical Director, Steven provided design proposals and TROX product selections for project specific applications. Over the last two years he’s advised and made selections on over 250 projects in consultation with distributors, consulting engineers and contractors. As Head of TROX/Airfoil, Steven will continue to use his specialist knowledge, experience and passion for air diffusion to provide design proposals and TROX/Airfoil product selections for project specific applications in Victoria, but also across Australia. TROX VARYCONTROL Type TVB-SSP is a pressure independent Variable Air Volume (VAV) terminal unit. It’s widely used for volume flow control of supply air in VAV systems with high level of technical and acoustical requirements. It can be supplied with electric heater and hot water coil and fabricated/tested with any free-issued controller. What gives TROX VAV Boxes the advantage is that they are tested and calibrated in the factory, not at the commission stage. This saves time and reduces the cost of installation. TROX Swirl diffuser type TCS is supplied with either circular or square face plate. The TCS offers high volume flow rate at low sound power levels. Due to the horizontal swirl-type discharge of the supply air, induction of room air occurs very quickly, resulting in a rapid decay of supply air velocity and temperature differential. A high level of comfort is acheived. The type TCS can be used for either supply or extract air application, suitable for both constant and variable volume flow systems. The VSD35 is TROX’s adjustable slot diffuser with aesthetically designed face sections. The diffusers face is a one piece extrusion so there are no visible joints. The low overall height means that the slot diffusers are particularly suitable for use in restricted ceiling voids and in suspended ceiling systems. The VSD35 type slot diffuser is characterised by high induction that results in a rapid decay in supply air temperature differential and air discharge velocity. Airfoil provides a ‘one stop shop’ for all your air diffusion products. We stock over 100,000 standard products in the Airfoil and TROX ranges. TROX lead times on standard products have been slashed from 12 weeks to 5 to 7 days. This immediate supply chain is supported by the fastest turn a round times for custom manufacturing in the industry. We welcome you to contact us to discuss your next order.